This surname, of English origin, is an occupational name for a painter of stained glass, and is derived from the Middle English (1200 - 1500), Old French "peinto(u)r" meaning "painter". The name dates back to the mid 13th Century (see below). Further recordings include John Peynter, a witness in the Assize Court Rolls of Kent (1317), and Thomas Peyntour (1430) in the Cartulary of Osneney Abbey, Oxfordshire. 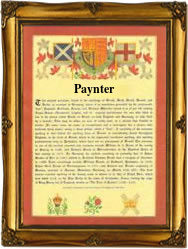 Variations in the idiom of the spelling include Paynter, and Peyntue. Recordings from London Church Registers include the marriage of John Paynter and Margery Taylor on October 19th 1530, and the marriage of Thomas Painter and Emme Wyllet on July 4th 1540. William Painter (circa 1540 - 1594) was the author of "the Palace of Pleasure" (1566). One Elin Painter, an early emigrant to the New World, is recorded as resident in Virginia in 1623. Michael Painter, aged 20 yrs., was a famine emigrant who sailed on the "Hayti" from Liverpool to New York on June 4th 1846. The first recorded spelling of the family name is shown to be that of Richard de Paintur, which was dated 1240, in the "Feet of Fines of Yorkshire", during the reign of King Henry 111, known as "The Frenchman", 1216 - 1272. Surnames became necessary when governments introduced personal taxation. In England this was known as Poll Tax. Throughout the centuries, surnames in every country have continued to "develop" often leading to astonishing variants of the original spelling.